Looking for a way to take that Ugly Christmas Sweater Party to the next level? Well, look no further, because we've got you covered with our Ugly Christmas Sweater Cookies! Not only are they fun to wear, but they're even more fun to eat! The designs are easier than you think when you use holiday sprinkles and cake icing to create the different "ugly" designs. 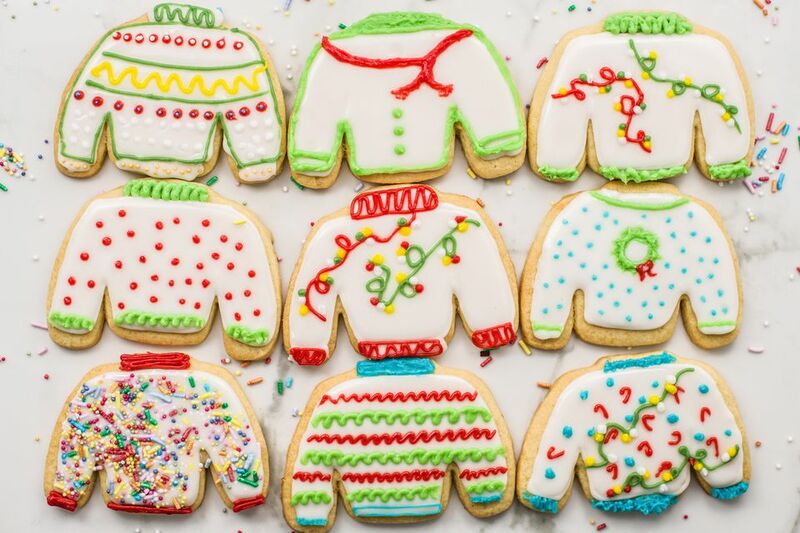 If you are a talented cookie decorator, you can also use royal icing, fondant or other decorations to enhance the sweater designs. To make your life easier, choose only one or two colors to flood the cookies. You can go a bit wild and use different colors for the icing decorations. It will save you a lot of time and you will still end up with adorable treats. Using a hand mixer or in a stand mixer with the paddle attachment, cream together butter, sugar, orange zest, and vanilla thoroughly. Add in the egg and beat with until light and fluffy. Add them to the creamed mixture, alternating with the milk. Divide the dough in half and place each half in a plastic bag to chill in the refrigerator for at least an hour. Roll out dough into 1/3-inch sheets. Cut out shapes and place onto a parchment lined cookie sheets. You will need to bake the cookies in batches and can re-roll the scraps into another sheet. Bake at 375 F for approximately 6 minutes. Do not allow the cookies to brown. While cookies are baking, mix together the powdered sugar, water, egg whites, and vanilla on high for about 10 minutes. Separate icing into two bowls. Add about 1 tablespoon water to one bowl and 3 tablespoons to the other. Dye the two frostings in the color of your choice or leave them white. Put frostings into separate squeeze bottles. Dye the vanilla cake frosting into different colors of your choice and place them into piping bags. You may not use all of the frosting. It depends on how many decorations you add to each cookie. After the cookies have cooled, edge the cookies with the thicker frosting. Fill the centers with the thinner frosting, using a toothpick to spread the icing all the way to the edge. After the base frosting has hardened on the cookies, use the vanilla cake frosting to add decorations to the cookies. Use different piping tips to create the different designs. Use the flower tip to make the wreath and tree designs, and a small hole tip to create stripes and swirls. Add different holiday sprinkles while the frosting is still wet. Allow the cookies to finish hardening and serve!